It has been a long week. Finally the weekend is here. 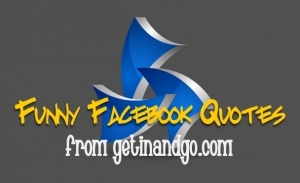 To get your weekend started how about Friday’s Funny Facebook Quotes. My weekend always goes better when I can start it off laughing. Enjoy your weekend! I’m not afraid of anything. I just need to know that I can breathe. I don’t need much of anything, but suddenly…. I am small and the world is big, all around me is fast moving surrounded by so many things. I am young, and I am free. But I get tired and I get weak. I get lost and I can’t sleep. How does it feel? Think I finally got caught up on my sleep… so I am going to climb out from under that rock. I have got to learn that hurtful words can only hurt you if you allow them to hurt you. Wonders how many people can go a whole week without going on Facebook? So wondering what my job really is? Is it to help little kids cross the street all day and to wave nicely at all the locals? NOOOOO… MY JOB should be an INFORMATION BOOTH for 2 gay guys on a motorcycle lookin for a campground or for some crazy cracked out hippy who couldn’t find his way out of a frickin paper bag……………………ughhhhhhhh much better……………..
At some point, you have to make a decision. Boundaries don’t keep other people out. They fence you in. Life is messy. That’s how we’re made. So, you can waste your lives drawing lines. Or you can live your life crossing them. But there are some lines… that are way too dangerous to cross. Heard a funny statement today. Talking with this guy and he said that his work boots that she got him “lasted longer than the relationship” I had to laugh. One more day till much needed girl’s night out……. Daughtrey, Cavo, Life house here we come Whoo hoo!!!!!!! My husband just called me and asked me to look up directions on Mapquest, THEN wouldn’t listen to them and said He could figure it out himself. Men are such direction jackards! Comment: she is a good reason to do anything…even leno. I find no fault in your choice. Comment: Conan would be very disappointed. nice site, just made my day! HAPPY FRIDAY!! I LOVE THEM!